Provides a clean and safe storage platform. 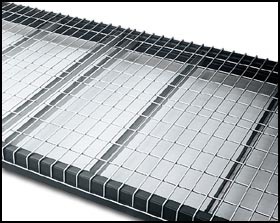 Durable 2" x 4", 4 ga. wire decking makes stored items easier to see and reduces fire hazards. Dust and dirt can't collect. Easy to use and install. Designed for step and box beams. Rugged reinforcing under channels are projection welded at intersections with sturdy steel wire deck mesh. Silver gray enamel coat finish. Please add "B" Suffix for Box Beam Design. FOB Shipping Point.